What Does It Mean The Droopy Nasal Tip? The term "ptosis", commonly used in the nasal area, means "drooping" of the nasal tip region. These types of noses are commonly referred to as drooping noses and hook noses. When you see a ptotic nose tip, you really get your attention, because you can easily see how the tip of the nose falls from the tip of the nose. In the front view of the nose with the tip of the ptotic nose, the nose looks quite round. In fact, in most cases, the tip of the nose appears to have a more oval shape as seen in the pre-operative photograph. The other common finding at the ptotic nasal tip is the relative inadequacy of the nostril show. This is completely opposed to what is typically seen in extreme rotation or "swollen nose". What most patients do not realize is that it is normal to see some nostrils in the front view. But too much nostril appearing from the front, both unnatural and can lead to a very short nose image. It is obvious that the tip of the ptotic nose is most easily understood in the side view of the nose. Here side - as you can see in the photo above, the tip of the nose just seems to be dropping from the tip of the nose. When you measure this objectively, you will see that the nasolabial angle in the ptotic nose (the intersection of the upper lip and the angle created by the long axis of the nostril) is much less than it should. The ideal nasolabial angle in women is between 100-105 degrees, indicated by intersecting yellow lines in the photograph. Ptotic or drooping nose toe nasal folds are often sharper - and in some cases even less than 90 degrees. In this particular case, nasal tip ptosis sample, nasolabial angle, is actually less than 90 degrees. The difference between these two angles visually shows how the nose tip actually hangs in the side view. In Patients With Droopy Nose Tip, Nose Tip Ptosis While Laughing Is More Than Normal! When the patient with the flaccid nose tip smiles, you can see that the nasolabial angle becomes even lower. Now this is something that happens to almost everyone when they smile - it's normal for the nose to look like a few degrees to the tip Şimdi. This is largely a result of the depressive septi nasi muscle shortening the upper lip area of depression. With a single smile, this muscle is contracted and the tip of the nose looks a little bit. In cases where the ptotic nasal tip is well below the locations where it is required to be positioned, this additional sagging becomes more pronounced as seen here. In some patients, even in some patients, the tip of the nose can be exaggerated downwards, causing the nose to appear longer than the front and the nose tip wide. ﻿In many rhinoplasty patients, surgeons recommend the transection or discontinuation of depression septi muscle. 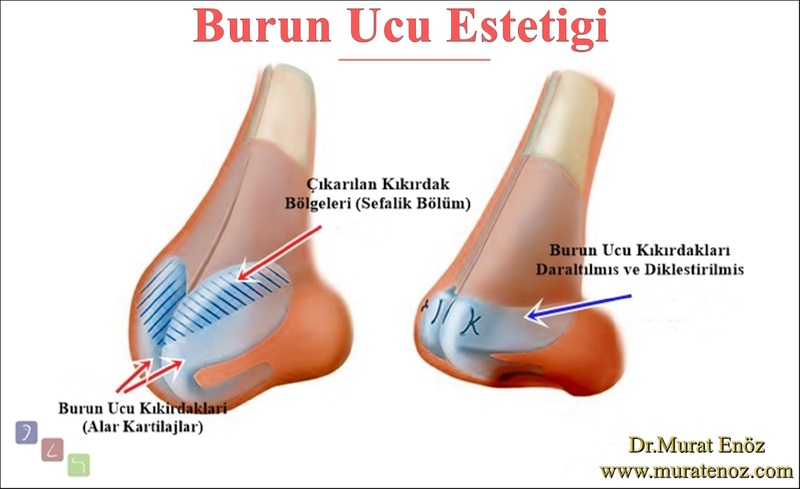 This muscle activity is eliminated, the upper lip will not shorten the smile and the tip of the nose will not drop as much as the thought - the tip of the tip of the nose is seen. But is this procedure really necessary? And the depression after surgery will change the laughing of the septi muscle change? The answers to these questions are in fact somewhat controversial among nasal aesthetic surgeons. In my opinion, I do not find it really necessary to interrupt muscle as part of the rhinoplasty procedure. If you had not had a full nose operation, you might prefer to cut these muscles as part of an isolated procedure. However, in terms of raising the tip of the nose, the results may not be as dramatic as desired. If an official nose surgery is performed, I usually recommend alternative techniques to remove the tip of the nose without interrupting the depression septi muscle. This typically involves repositioning the nose cartilage frame to place the nose tip in a more ideal, aesthetically pleasing position. In terms of its effect on smile, depression is thought to have little effect on a person's smile after discontinuation of the septi muscle. Dr.Toutounchi et al. 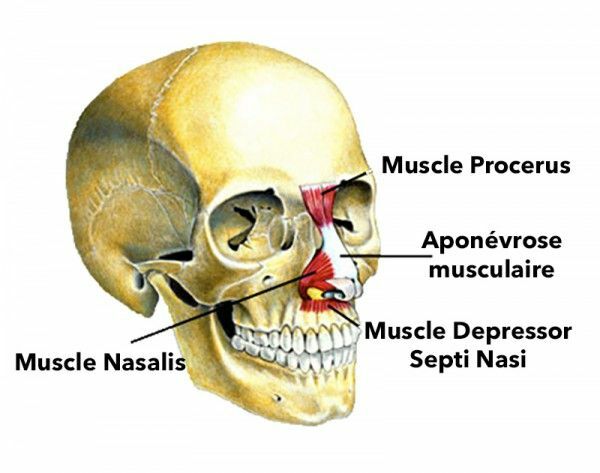 published by and for the evaluation of effects on nasal tip rotation modification of the septum muscle depression and projection "Effect of the Depressor Septi Nasi Muscle Modification on Nasal Tip Rotation and Projection" is the scientific studies, the discontinuation of depressed septum nasi muscle by helping to rhinoplasty and repositioned, nasal tip rotation and no additional advantage in terms of projection or patient satisfaction. ﻿﻿﻿The open technical approach to reconstructing the nasal tip cartilage support tissues in the pendular nasal tip aesthetic surgery has many advantages. There are various suture techniques, cartilage shaping procedures, and additional cartilage graft insertion techniques in the lateral and outer legs of the alar cartilages, which are responsible for the shape of the nasal wings, in the operations of the pendular nose end aesthetics. In the midline of the nasal tip, the cartilaginous limbs of the alar cartilage are called as "kolumellar strut grafts". Number of process is available. Apart from these, there are also "deep nose strap" techniques in which the tip of the nose is hanged upwards. The image above shows the formation and reshaipng of alar cartilages at the tip of the nose. In the photo above, there is a kolumellar strut graft and a cap graft animation that is finally placed at the tip of the nose. 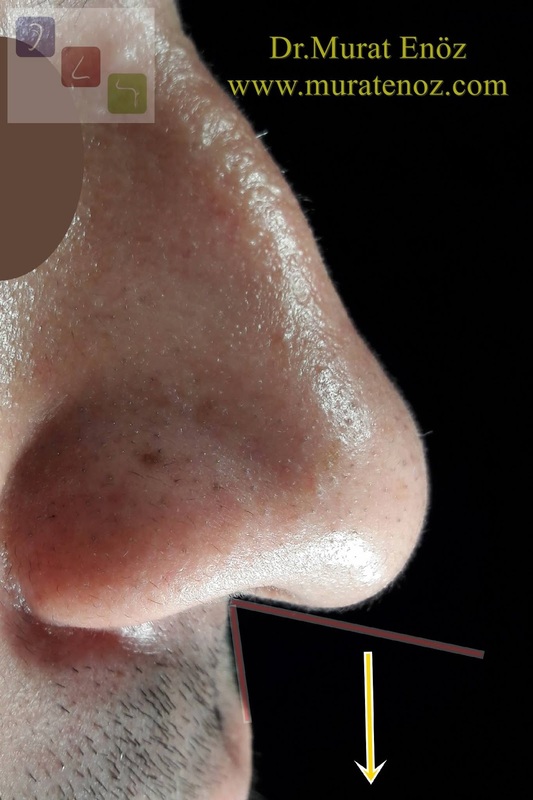 In this chelil, drooping nose treatment is provided; at the same time the tip of the nose is narrower than the front and the air channel opening in the nose is increased. 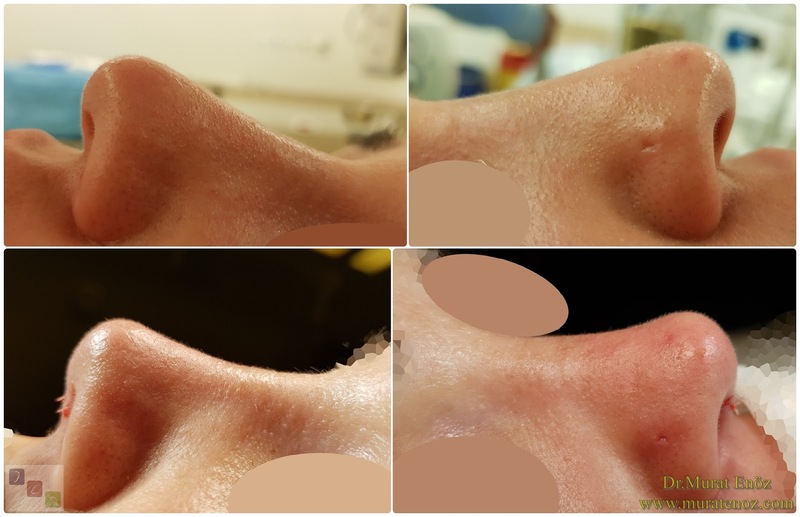 Below, you can see ptotic or drooping before and after the procedure in the pictures showing typical results for nasal tip correction. You can easily see that you have a change in the appearance of your nose from your photos. In fact, the nasolabial angle was developed near 100 degrees with a difference of 10 degrees compared to the preoperative nose. Even when he smiles, you can see that the tip is quite stable and never dropped (depressive septi nasi muscle has not been cut).